Converting sugars to hydrocarbons requires separating large amounts of water from usable product, an expensive undertaking. Integrated cost-effective methods for recovery of key fuel and co-product intermediates from aqueous media. 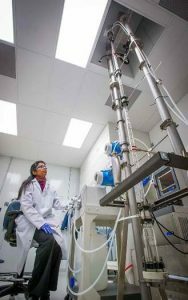 The Biochemical technology team leverages its expertise to conduct experiments at the bench-scale (≤1 liter), transferring microbes, fermentation conditions, and lignin samples to partners for research and development activities as needed.